If you use theme with components that different from components on standard theme, that can cause some problems after products filtering. You can fix this problem yourself. Contains settings for customization links, page load and global widget display. Where can you find Product Key (Plugin key)? Get selectors automatically (BETA) - Generating additiona products and category to check selectors in your theme. Work great with a lot of theme. Use it if you do not know correct selectors for your theme. Can work slow on some hosting. Sorting control - if disabled order by drop down didn't use ajax for sorting. SEO friendly urls - change URLs after filtering and uses this link for open filtered products. If this option is on url will be changed when filter is selected/changed - uses only GET query. Use slug in URL - by default filters uses id in URL. If you enable this option filters in URL will be use slug instead id. Don't use symbols '-', '_' and '+' in slug. Nice URL - use permalinks instead GET query. You can change permalink style in WordPress permalinks settings. Template ajax load fix - if disabled plugin use standard WordPress AJAX functions. If enabled uses different products load style. If you disable this function products may load faster, but you theme must use WordPress and WooCommerce default templates. Thousand Separator - Uses only in sliders with numbers. Decimal Separator - Uses only in sliders with numbers. For example: if you set this to '-', then 12.25 will be 12-25. Number Of Decimal - number of digits after Decimal Separator. Contains settings for customization style of checkbox, buttons, text and sliders. On Update - when server AJAX load answer from server. Access to the data returned via AJAX is variable global_ajax_data. To adds information to the AJAX data use berocket_ajax_response_without_fix hook if "Template ajax load fix" or uses PHP fixes or embed? to the page with other fixes. Permalink settings are in Admin Panel -> Settings -> Permalinks. Go to BeRocket AJAX Filters section. You can see one field and two drop down menu. 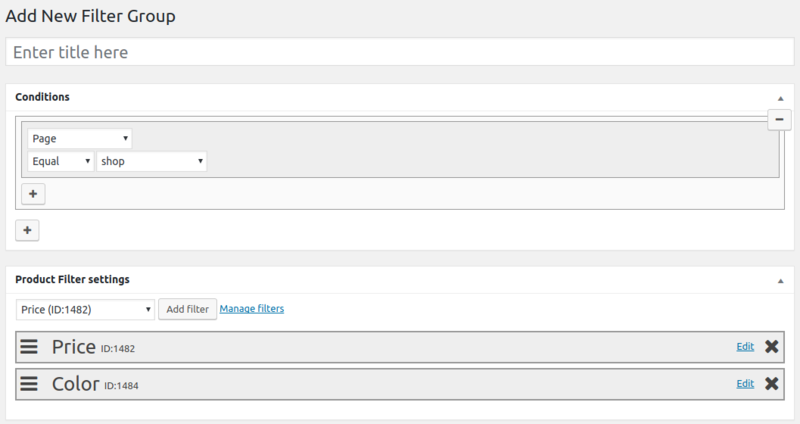 Settings for Product Filter are same as settings from old Widget, but without limitation by page and product category. Product Filter post title uses as title for filter. But limitation you can add only for Product Filter Groups. Post title - uses only to identify group in widgets. Not uses on frontend. Conditions - you can select where group will be displayed. You can select pages, categories or attributes. 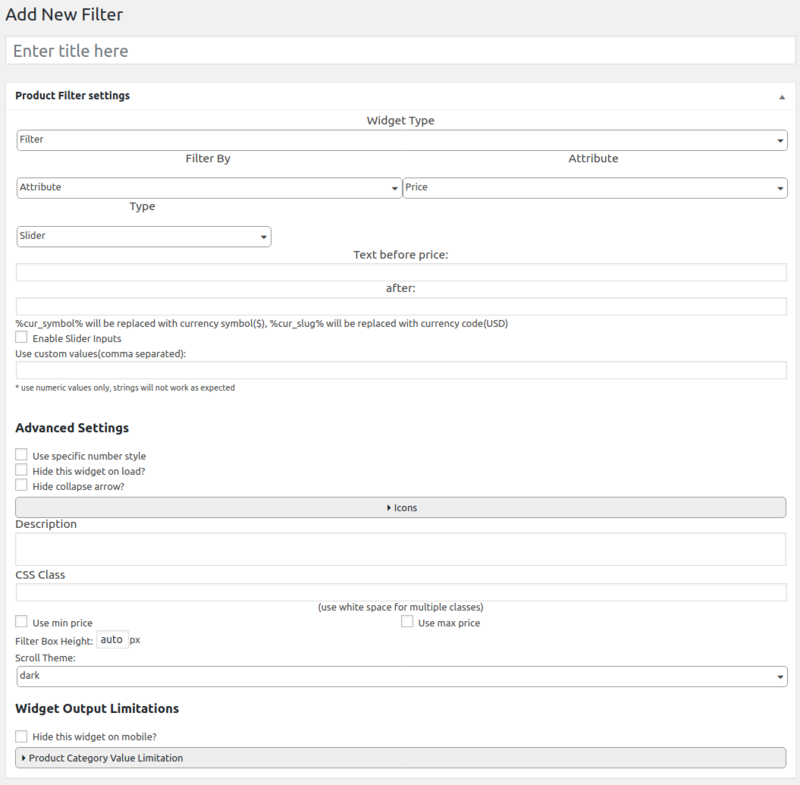 Product Filter settings - Add, remove and sort filters in group. Widget that display filter on all pages where sidebar will be displayed. Better will be to use AAPF Filters Group to display filters. Widget that display all filters from group on pages that matching conditions from group. The widget from plugin called AJAX Products Filter. You can place this widget tto any widget area like other widgets. With different settings will be available different options. Tag - filtering by products tag. For example: if you set description to "Select color of products"
First widget with title "Color 1" will be with Child/Parent Limitation set to Parent, then second widget with title "Color 2" will be with Child/Parent Limitation set to Child and Child depth set to 1. Widget with Filter By set to Attribute have some additional fields. Product sub-categories, Tag and Custom Taxonomy have some additional options. Used for display information before AJAX Product Filters widgets. Used for display information after AJAX Product Filters widgets title and ul tag. Used for display information before AJAX Product Filters widgets closing ul tag. Used for display information after AJAX Product Filters widgets. Don't change array structure and information if you didn't know for what is it. All of these functions is in class BeRocket_AAPF as static functions. Filter for permalink rewrite rules. Add rules for nice URLs. Function for add rewrite end point for nice URLs. Default templates places in plugins folder woocommerce-ajax-filters/templates. 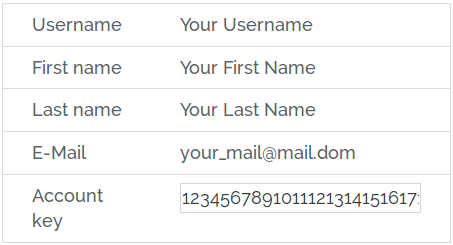 To rewrite the template in your theme folder create folder with name woocommerce-filters and places new template with identical name in this folder. WooCommerce AJAX Products Filter use different options in different places. Contains all options from plugin settings page. Contains current plugin version. Uses for correct plugin update. Contains all settings from permalink page.